I’ve been listening lately to a number of recordings of symphonies from the Classical era – say, 1760 to the advent of Beethoven – from composers sent to near-obscurity by the fame and success of Haydn, Mozart and Beethoven – and the more I listen, the more it has changed the formulation of the question I’d been asking myself about the music of that era. Now the question is not so much “why have all these composers fallen into near-oblivion”, because in a way, that’s easy to answer: the musical sensibilities changed dramatically in the first 30 or 40 years of the 19th century, giving rise to the Romantic style of Weber, Schubert, Berlioz, Mendelssohn, Chopin, Schumann, Liszt, Wagner, Brahms (this is listing by chronological order); also, as the previous centuries and unlike the next (with the advent of the sound recording and of “contemporary” music), the 19th century was not turned to the past, but to the present. No wonder then that all these composers disappeared from the music vista. So the real enigma becomes: why then did Haydn and Mozart survive? (despite the legends surrounding his death, Mozart was never, even during his lifetime, a neglected composer; and soon after his death, he skyrocketed to the Pantheon of all music lovers; Don Giovanni was Goethe’s favorite opera, and to him Mozart was the composer who’d have been best fit to compose the music for Faust; and – proving again that you can be a great writer and near-sighted, or rather hard-of-hearing, in matters of music – Goethe spurned Berlioz’ essay and tribute, the Eight Scenes from Faust, later to be developed into the Damnation). With Mozart, there are a number of factors that can help explain that he was adopted by the Romantic generation: precisely the “romantic” mysteries surrounding his death, the harbingers of romanticism in the late symphonies and piano concertos, and, of course, Don Giovanni and Nozze. But Haydn? Mind you, I’m not implying that Haydn is a lesser composer and not worthy of the place afforded to him by posterity. But why Haydn and not Dittersdorf, Vanhal, Kozeluch, Kraus? Of course, the easy answer would be to claim that Haydn’s music is significantly better than the music of those composers. I’m very ready to admit that my familiarity with Haydn is very superficial (it is), but hearing the works of these other composers, I don’t hear such a significant inferiority. That Haydn was universally feted during his lifetime and especially old-age may explain that he never disappeared from the repertoire after his death, but then some of these other composers were also recognized and feted during their lifetime, which didn’t prevent them from disappearing from public attention immediately after their passing. 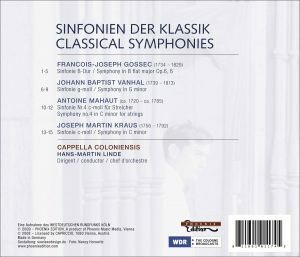 So the question will remain unresolved for the moment, but my (long) point is that I find the symphonies of Gossec, Kraus and Vanhal here recorded as enjoyable as Haydn’s. Those of Vanhal and Kraus are very “Sturm und Drang”, powerful and dramatic; Kraus’ starts with a superb, plangent and dramatic slow introduction and Vanhal’s slow movement stages an endearing dialogue of solo violin and viola, a Symphony concertante in all but name. Gossec’s Symphony op. 6-6 is formally original in that it ends with a double Menuetto (an A-B-A form in fact) rather than the expected allegro finale (that would have been the penultimate Fugue, introduced by a short Largo) – it is something of an anticlimax, I must say. It also boasts very appealing pizzicati passages in the slow movement. While all three have been recorded by other ensembles, Antoine Mahaut (ca. 1720-1785) is here, for me at least, a first encounter. Even his biography seems piecemeal and full of “probablys”: witness Wikipedia, “Probably a native of Namur, and having lived in Amsterdam from 1738 to 1745 to escape his creditors, Mahaut probably joined Johann Stamitz at Mannheim in 1745 and even left with him for Paris in 1754. His symphonic style is similar to Stamitz, who most likely taught him how to compose, while he was at Mannheim (although he may have received some instruction while living in Amsterdam). He flourished in France, composing in the galant syle that Stamitz had taught him, and he died there in 1785 at the age of 65.” His symphony is the most archaic of the lot, with its three-movement shape, its scoring for strings alone and basso, its outer movements reminiscent of the Italian sonatas from the early 18th century and its Adagio in Siciliano ternary rhythm. 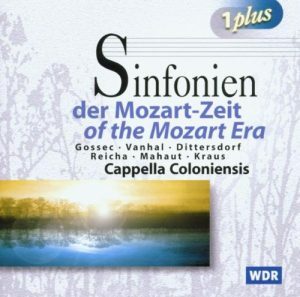 These readings by the Cologne-based Capella Coloniensis – one of the oldest “historically-informed” ensembles, established in 1954 – under Hans-Martin Linde are serviceable and on first hearing might sound more than acceptable, but a comparison with the competing versions of another Cologne-based period instrument ensemble, Concerto Köln, immediately shows how flawed they are. 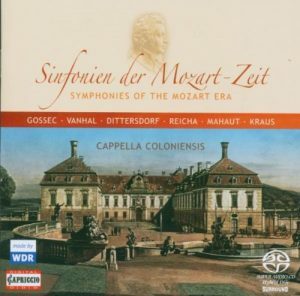 Concerto Köln’s Gossec CD doesn’t include op. 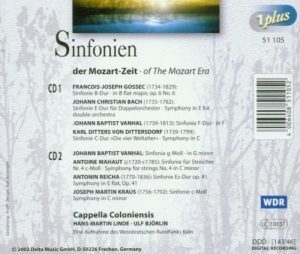 6-6 (Capriccio 67 073, barcode 4006408670735) and it is another Gossec Symphony they play on their CD of symphonies from the French Revolution (Capriccio 10 280, “La Prise de la Bastille: Music of the French Revolution“), but their CDs of Kraus (Capriccio 10 396) and Vanhal (Teldec 7 0630-13141-2 8), feature the same works played by Linde. 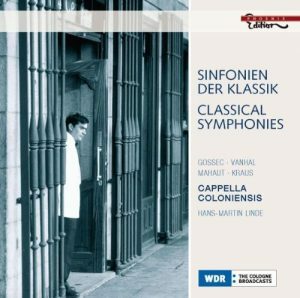 In both symphonies, Concerto Koln is incomparably more dynamic, beefy, powerful and dramatic. Heard in direct comparison, Linde sounds elegant, well-mannered and rather uninvolved, not entirely devoid of power in the outer movements but lacking bite and drive. In Vanhal especially, compared to Concerto Köln, Linde and his band appear heavy-footed and pedestrian (and the sonics aren’t as vivid). Mind you, I don’t think anyone would be turned away from whatever beauties there are to be heard in the works (I enjoyed the disc before putting the CDs of Concerto Koln on the tray), but won’t hear them to their full extent. 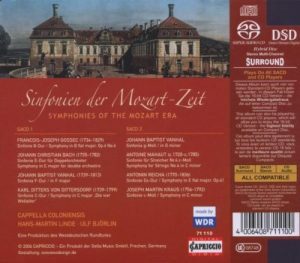 So better invest in Concerto Köln’s recordings (there’s a volume 2 with four more symphonies on Capriccio 10 430, and both volumes have been gathered on a twofer from Phoenix Edition, PE 424, although it may be cheaper to buy the two original releases) and take this one as a complement only, or a first introduction to better things. Linde’s way may have an appeal also on those who would like a less driving and high-strung, more cozy approach to the music.